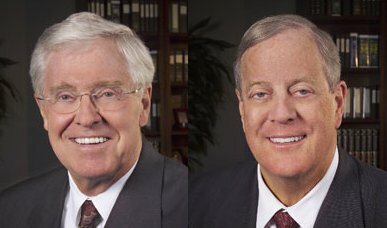 WASHINGTON — Freedom Partners Chamber of Commerce, the central hub of the political empire of the billionaire brothers Charles and David Koch, reported raising $57.5 million in 2013 and disbursing $41.7 million to organizations in the Koch network. Freedom Partners, founded under the radar in 2011, emerged in 2012 as the main bank for Koch-related political operations. The group, organized under IRS rules as a 501(c)(6) trade association, distributed more than $250 million in the 2012 elections to an array of groups. Overall, the entire Koch network spent $400 million in 2012, according an investigation by The Washington Post and Center for Responsive Politics. With the $25 million cash on hand it brought into 2014, Freedom Partners has already played an even bigger role this year. The annual tax filings for nonprofits involved in the complicated Koch network provide a glimpse into the brothers’ murky political world. As the Koch central node, Freedom Partners’ 2013 filing, posted to the group’s website on Wednesday, casts light on the organization’s dark money. A number of Koch groups were cut loose and have seen their electoral role shrink dramatically after a series of losses in 2012, none more painful than the failure to defeat President Barack Obama, and a scandal in California involving groups within the network. Now, the majority of the groups receiving money from the Koch central bank are those also founded by the Kochs and their network. These include Americans for Prosperity, American Energy Alliance, Center for Shared Services Trust, Concerned Vets for America, Evangchr4 Trust, Generation Opportunity, Libre Initiative, Public Notice and Themis Trust. These groups received $40 million of the $41.7 million distributed by Freedom Partners in 2013. Themis Trust, the big data operation run by the Kochs that publicly goes by the name i360, received the most Freedom Partners money — $9,125,000. This grant is a huge investment in building a massive voter file for reaching voters on a personalized level. In 2012, Themis Trust received $5.8 million from Freedom Partners, and has taken in $7 million from TC4 Trust, a now-defunct Koch money conduit, since 2010. In August, Themis officially announced it would share its data file with the company holding the exclusive data contract with the Republican National Committee. This brought what was once a contested space between the party and the Koch world together. The other big recipients of Freedom Partners grant money were the Center for Shared Services Trust, with $7,405,000, and Public Notice, with $7,110,000. The Center for Shared Services operates as an administrative support operation for the Koch network providing nonprofit recruiting and consulting services and job postings for Koch-funded groups. Public Notice is predominantly involved in promoting austerity policies to reduce the national debt and cut Social Security and Medicare. Recently, however, it began shopping opposition research on opponents of the Kochs to reporters. Big political advertisers in the Koch network that are spending large sums of undisclosed dark money in 2014 also received grants from Freedom Partners. Americans for Prosperity, the chief political and lobbying arm in the Koch empire, received $1,465,000 in 2013, before it began running more than $30 million worth of advertising attacking Democratic Senate candidates for their support of Obamacare. Concerned Vets for America received $5,245,000 from Freedom Partners in 2013 and emerged in 2014 as a major advertiser, with attack ads hitting Democrats on the Obama administration’s handling of the scandal at Veterans Administration hospitals. The group has already spent at least $5.7 million on advertising targeting federal candidates. The Koch-backed Latino outreach group Libre Initiative, which has already spent $2.1 million attacking 2014 candidates, received $3.3 million from Freedom Partners. Best known for bringing a creepy Uncle Sam to binge-drinking sessions at college football tailgate parties, the Kochs’ youth outreach group Generation Opportunity received $6 million in 2013 from Freedom Partners. Aside from parading creepy Uncle Sam around campuses, Generation Opportunity spent $2.3 million on advertising on the 2014 election. The Kochs’ evangelical group, Evangchr4 Trust, received $355,000, and the pro-fossil fuel energy group American Energy Alliance received $40,000. Other groups outside of the immediate Koch network received funds as well. These included Heritage Action for America ($500,000), Concerned Women for American Action ($260,000), West Michigan Policy Coalition ($250,000), Susan B. Anthony List ($150,000), American Commitment ($140,000), National Taxpayers Union ($105,000), Coalition to Reduce Spending ($100,000), Let Freedom Ring ($25,000) and US Health Freedom Coalition ($25,000). The Center to Protect Patient Rights, once a major conduit for Koch money and now known as American Encore, received $150,000. This small grant underscores the shift in the relationship between the Kochs and American Encore’s chief consultant Sean Noble. Previously the lead consultant directing Koch money around the country, Noble fell out of favor following his use of the Koch network to illegally funnel undisclosed money into a California ballot initiative campaign. This involved the Center to Protect Patient Rights and the American Future Fund, an Iowa-based group heavily funded by the Koch network. American Future Fund received no funds from Freedom Partners in 2013 after receiving $13.6 million in 2012. Beyond its grant-giving activity, Freedom Partners stepped directly into the electoral arena in 2014 by running more than $7 million in issue-based attack ads targeting Democratic candidates. The group has also launched its own super PAC — Freedom Partners Action Fund — which has already spent $3 million.